A Steam-Punk chorus of cadaverous ghouls, zombified and singing Christmas carols in twitching harmony is about as far from traditional as you can get, and quite possibly the most satisfying prologue for A Christmas Carol I’ve ever seen. Accompanied by Annalee Scott on guitar and containing a comic rivalry among two of its members, the lusty chorus fills the tiny theatre with versions of Mariah Carey’s “All I Want For Christmas,” Gounod’s “Ave Maria,” and traditional carols like “The First Noel” and “God Rest Ye Merry Gentlemen.” The delicious irony of the undead singing these particular songs made me laugh out loud. A lot. They return throughout the one-hour adaptation of Scrooge’s familiar story playing multiple characters, narrating transitions, providing sound effects, and maintaining an unforgettable mood in this spookier than normal Christmas narrative. It was a welcome departure for someone like me who has literally seen more versions of A Christmas Carol than I’d ever want to count. Sebastian Muñoz, as Scrooge, has good reason to be scared. If Zombie Joe burst into my room in the middle of the night as the Ghost of Jacob Marley I’d be doing some screaming too. 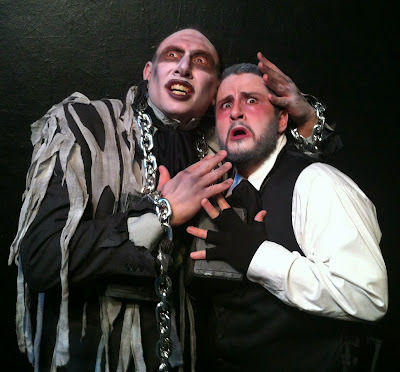 Carrying giant chains (and wearing a terrific make-up design), the undead soul warns Scrooge that he will be visited by three ghosts to whom he must listen or suffer a horrible fate. Zombie is in his element here, larger than life and terrifyingly wild-eyed. The Ghosts of Christmas Past, Present and Future are all played by director Denise Devin who spirits Muñoz around the black box sky with deliberate intensity. Clothed in a Victorian gown, her Christmas Past resembles a faded bride whose youth and promise of life have been left standing at the altar in some long forgotten place. The haunted quality is in stark contrast to her boisterous portrayal of Christmas Present, the redheaded dynamo who uses Scrooge’s own words against him. The change is so unexpected that it draws laughter from all sides, but that’s what this production does best; elicit a gut response over and over as it moves quickly from scene to brief scene, character to fragmented character. I think the shortest was the cameo of the two Zombie children – “the girl is want; the boy is ignorance” – but in its few short seconds it communicated the sad horror needed to leave a lasting impression. Jason Britt is a natural as Bob Cratchit, full of warmth and quiet dignity. Vanessa Cate, as Belle, also stands out as she creates another poignant picture of Scrooge’s selfish path. This is A Christmas Carol that carries with it elements unique to the ZJU aesthetic that work beautifully for Scrooge’s tale of redemption. Devin’s staging is creative, briskly paced, and ripe with moments that feel fresh. The actors walk the line between reality and oddity in their character work and that always makes it interesting. Best of all, you’re never quite sure what will happen next. And that means that the company has done its job. For a ghostly holiday cup of cheer from one of the most inventive theatre companies in town, don’t miss the final performances of Zombie Joe’s Underground Theatre’s A Christmas Carol.